In 1955, an enthusiastic group in Hillside received a charter to organize as the Chamber of Commerce. The Chamber’s first undertaking was to start a Public Library for Hillside. The Illi nois Library Association promised 1,000 books to be put at the disposal of a Library as soon as space could be found. A local resident also donated many books from her own collection. The site chosen was a stove-heated frame building on Hillside Avenue near the early post office. The Hillside Public Library opened its doors in May 1957 and remained at this location until 1961. In February of 1962, the library planned to change its location to a store on Butterfield Road. Volunteers from the Kiwanis Club worked relentlessly to move equipment and books. Local building supply companies, hardware and paint stores donated wooden shelving, shelf brackets and paint to prepare the new site for its opening. On St. Patrick’s Day, 1962, the library reopened under the sponsorship of the Kiwanis Club. Within two hours, 168 library cards were issued to children and another 75 became cardholders the next day. At this time, the Friends of the Library was formed to support library service by volunteering as librarians and to acquire more books for the library. Fund drives were started and the library fund was created to establish a permanent service. Petitions were circulated for a special election with the result that on Saturday, February 16, 1963, the Municipal Library was approved overwhelmingly by the voters, and the first Board of Trustees was elected. One year later, in February 1964, the library was moved to the second floor of the Village Hall. More and more new books were purchased, a reference section started, and cataloging according to the Dewey decimal system was accomplished. By 1966, the number of books totaled 6,000. 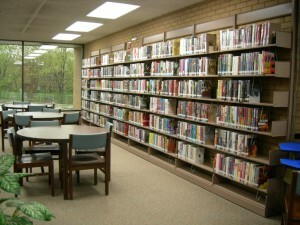 At this time, the Suburban Library System was being organized and interest in a Public Library building was increasing. The need for a professional librarian was filled by several candidates in the intervening years. Finally, in 1976, the Public Library building at 405 Hillside Avenue was completed and is continuing to serve its 8,155 local residents today with holdings of approximately 50,000 titles and a variety of media including books, CD’s, DVD’s, graphic novels, magazines, and e-resources.